Episode 62 – Adelaide Goodeve | Dirt in Your Skirt – Explore. Conquer. Inspire. Adelaide Goodeve joins the podcast this week to talk about overcoming her Chronic Fatigue Syndrome/ME for 4 years as well as other chronic conditions which forced her to withdraw from University College London. She found a Neuro-linguistic program and in three days she was completely recovered. She spent the next four years figuring out what she wanted to do in life. This included going back to King’s College London and then quitting because she was so unhappy. Since that time she has traveled/adventured a lot – all over the world and 90% on her own, so I loved this and wanted to pursue this passion. Neuro-linguistic programming, coaching, physiology and hypnosis and about to create a business as a Transformational Coach and Brain Trainer. Looking to stave off that sugar craving. 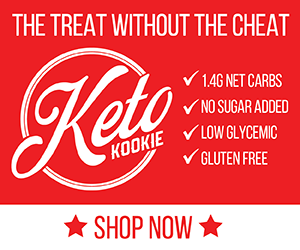 Keto Kookie has created a new cookie you can eat without the guilt. Use code: DIYS and save 10% on your order today.